Your friendly neighborhood Spider-Man is here!! 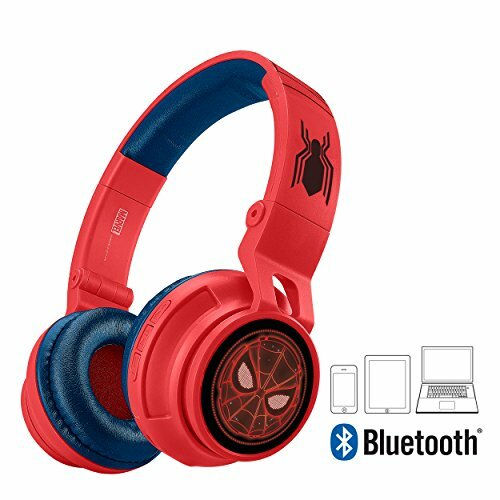 The Spiderman Bluetooth headphone is here so you can enjoy whatever music you like wirelessly. These headphones have reduced volume to ensure safe listening levels for kids. The built- in rechargeable battery allows up to 18 hours of continuous playtime. Included is a built-in microphone for talking to friends and family. A bonus detachable 3.5mm audio cable is included so you can connect to any device with a headphone jack. Adjustable headband and padded ear cushions provide maximum comfort and a custom fit. The foldable design is ideal for convenient travel and storage. This will make a perfect gift or birthday present for anybody who enjoys Spiderman or music in general. Bluetooth: Wirelessly stream audio from a smartphone, tablet, or computer. Kid Friendly: Volume reduced to ensure safe listening levels for kids. Built-in Microphone: For talking to friends & Family. Battery & Cable: Built-in rechargeable battery allows up to 18 hours of continuous playtime. Bonus detachable 3.5mm audio cable connects to any device with a headphone jack. Quality: Adjustable headband and padded ear cushions for maximum comfort. Foldable design ideal for convenient travel and storage.